The School's Equity and Diversity Adviser, is happy to advise students or staff about any concerns or issues that relate to equity and diversity. 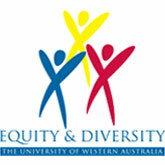 The Graduate School of Education supports The University of Western Australia's aspirations to provide an equitable and inclusive environment for all staff and students. We seek to model good equity and diversity practice within the Graduate School of Education and in engagement with the broader community. A commitment to the values of equity and diversity is an explicit expectation of student "disposition" as articulated in the School's Postgraduate attributes. As a discipline, education has a special role to play in promoting equity and diversity, particularly regarding access to and participation in education. The School's initial teacher education courses include a wide range of opportunities for students to engage with issues that relate to equity and diversity, to explore implications for teaching and learning and to develop personal and professional competencies in support of equity and diversity. These include a compulsory Aboriginal Education unit delivered by UWA's School of Indigenous Studies and a compulsory introduction to Courageous Conversations about Race. Throughout initial teacher education courses students explore some of the key principles and practices of equity in relation to disability, sexuality, gender, race, ethnicity and cultural diversity. The University recognises religious and cultural diversity and whilst the UWA calendar does not cater explicitly for diverse religious or cultural observance days, it is a School expectation that any reasonable student or staff commitments to such observances will be honoured. Lecturers or co-ordinators should be approached in good time if such observances preclude students from attending lectures or meeting other academic obligations. It remains the responsibility of the student to negotiate appropriate arrangements that enable them to meet the requirements of the course or unit. Professional Practice forms allow students to identify religious or cultural observances that may impact school practicum arrangements. The University’s interfaith calendar is available online. If the observance of significant religious or cultural days not identified on the University interfaith calendar precludes you from meeting University obligations, you may be asked to provide a justification.